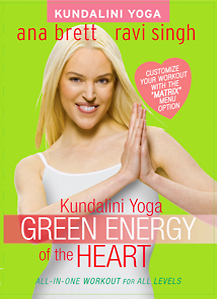 Kundalini Yoga Green Energy of the Heart - All-In-One Workout! What the world needs now is love sweet love! Green Energy of the Heart will transform your body, elevate your mind and emotions, and give you the strength and courage to live with a heart wide open. Ana and Ravi's signature style of Kundalini Yoga is the best of both ancient and new: the beauty, depth, and power of yoga, plus the streamlined results of cutting edge fitness. This DVD has it all: stretching, ab work, a cardio element, total body toning, and of course Kundalini Yoga's dynamic blend of movement, poses, breathing, and bliss. This DVD contains two warm-ups sets, two great Green Energy workouts, a fun Meditation, and more. Also featured is great music to SHAKE YOUR CHAKRAS & ROCK YOUR SOUL. Bonuses include a Breath Primer and a Cobra / Backbend Primer. Also featured is the Matrix Menu option which allows you to program your workout based on your time and motivation. Whether you are new to yoga or are a long time practitioner, this DVD will be your friend for life. Total Running Time: 75 min.